A dispute over a small legal bill morphed into a public spectacle Tuesday as a months-long feud between San Luis Obispo County District Attorney Dan Dow and several top county officials reignited at a board of supervisors meeting. During the meeting, Supervisor Bruce Gibson took shots at the district attorney’s character, while Dow refused to concede he was in the wrong. Gibson also persuaded the board majority to go against usual practice and to reveal what was said in closed session discussions between Dow and the supervisors. The hearing concluded with no resolution to the outstanding $2,874 legal bill. Dow responded with a statement saying he is considering taking the board of supervisors to court over the issue. Dating back at least to last April, Dow has clashed with Gibson, County Counsel Rita Neal and other top county officials over multiple issues relating to employee pay. The primary point of contention has been the more than 30-year practice of deputy district attorneys receiving paid time off in exchange for on-call work in which they make themselves available around the clock to help law enforcement officers with search warrants. Several county officials, including Neal, say the compensation arrangement violates state law. Many observers suspect political leanings are at the heart of the feud. Dow, a Republican, has aligned himself with rivals of Gibson, a Democrat. Recently, Dow endorsed the reelection campaign of Supervisor Debbie Arnold, as well as the campaign of John Peschong, a Republican strategist who is vying to replace retiring Supervisor Frank Mecham. Dow won the district attorney’s race in June 2014, defeating then-assistant DA Tim Covello, whom many leading Democrats in the county endorsed. A large factor in Dow’s successful campaign was the support he garnered from nearly all of the county’s deputy district attorneys. On Tuesday, Gibson accused Dow of attempting to satisfy the interests of deputy district attorneys while demonstrating an unethical response to a whistleblower complaint. Last March, county auditor Jim Erb launched an investigation into the pay issue after receiving a whistleblower complaint about the matter. Erb and Neal then concluded the compensation was illegal because the paid time off was not approved by the board of supervisors nor included in a written labor agreement, as required by state law. In April, the board of supervisors met with Dow in closed session and ordered him to put a halt to the paid time off practice. Dow then discontinued the practice. But, when Erb said he was considering recouping some of the pay from current deputy district attorneys who had been promised the compensation upon their hiring, Dow sought another legal opinion on the matter, Dow said. Dow obtained an opinion from Fullerton law firm Jones & Mayer, which stated the “quid pro quo” of providing paid time off in exchange for on-call duty is legal. The law firm cited county code, which allows the district attorney to arrange employees workdays and workweeks. Jones & Mayer represents numerous government agencies in California. Dow said he planned to pay the firm for the legal advice using funds in the district attorney’s office budget. Erb would not approve the payment, though. Erb said Dow must obtain approval from the board of supervisors before making the payment. On Tuesday, Erb requested the board approve the payment of the legal bill. But, the board voted 4-1, with Arnold dissenting, not to approve the payment. Before the vote, supervisors and county officials argued the issue for about an hour. Gibson interrogated Dow as to why he would seek another legal opinion after agreeing in closed session to end the paid time off practice. The supervisors also voted 4-1, with Arnold dissenting, to waive the confidentiality of its closed session discussion. Dow argued he has the authority to seek outside legal help. He cited a California attorney general opinion, as well as the county’s purchasing policy that allows department heads to seek outside professional services up to $2,500. Legal assistance is one of the services listed in the county policy. Additionally, Dow argued he could seek outside legal help because Neal, the county attorney tasked with advising him, had a conflict of interest on the matter. A July email exchange between Dow and Neal shows Neal acknowledges the district attorney can obtain another legal opinion if the county counsel has a conflict of interest. Neal said she had no conflict of interest, though. 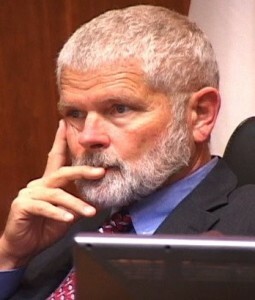 In response, Dow wrote that from the beginning of the dispute, Neal had been providing more information and legal analysis to Erb and other county officials than she had been providing to the DA’s office. “It has not been clear from the beginning whether you have been representing the interests of my department,” Dow wrote in a July 21 memo to Neal. Unlike Dow and Erb, Neal does not hold an elected office. Neal was appointed county counsel by the board of supervisors. 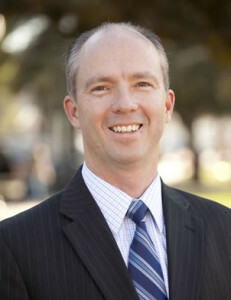 The county counsel’s office and the district attorney’s office were also pitted against one another in separate pay dispute that arose shortly following the whistleblower complaint. At an April board of supervisors meeting, Dow spoke during public comment and criticized a human resources department recommendation to begin paying county counsel’s office attorneys more than deputy DAs. Since the two departments had been separated about 40 years ago, the two groups of attorneys had essentially been paid the same amounts, Dow said. Dow also said the county used poor data comparisons as the basis for the pay recommendations. The county counsel comparisons included the salary of the executive vice chancellor and general counsel of the California State University system while the district attorney comparisons did not. The deputy district attorneys’ union is currently in labor negotiations with the county. Salary increases and paid time off are both elements of the negotiation. I encourage readers to watch the meeting online. The agenda item was whether to approve payment of Dan Dow’s legal bill but the discussion evolved into much more. Early last year a whistleblower exposed a 35-year practice that allows Deputy DAs to work “on call” (which allegedly amounted to about three hours of work but was not logged or recorded) in exchange for nine paid days off per year, and that the practice was not approved by the County which made it illegal. The County Auditor, Jim Erb, investigated the claim and found it was true. He advised Dan Dow to discontinue the illegal practice. Mr. Dow argued that the fact that the practice was established by Christopher Money about 35 years ago, therefore it should be allowed to continue based upon the long precedence. He argued that caselaw supports a finding that an long-established practice can be deemed legal without the County’s approval. Frank Meacham disagreed, saying that the practice is illegal and to continue it would open the County up to a lawsuit by the taxpayers. .
During the meeting, the Board, the County attorney and Mr. Dow discussed the details of the April 2015 closed session meeting. The Board thought there was a meeting of the minds and the matter regarding continuance of the practice was resolved. It was mentioned several times that they all wanted to avoid the public finding out about the practice and possibly bringing a lawsuit against the County. Adam Hill noted they joked about the fact that the taxpayers of SLO County are represented by the Central Coast Taxpayers Association and the president of the association is Jordan Cunningham – the son of Assistant DA, Lee Cunningham – who was receiving the illegal benefits. That relationship made a lawsuit by “the taxpayers” unlikely. It was also revealed that Mr. Dow promoted a Deputy DA to a higher position on the very day he retired. The promotion entitled the employee to an additional $5,000-$6,000 in retirement income from the County despite the fact that he did not work a day in the new position. Essentially, Mr. Dow fleeced the taxpayers using this scheme for the benefit of the retiring employee. Mr. Dow continued to assert that he had never received any legal memo regarding the legality of the overtime/paid vacation practice from County counsel. Therefore, he sought outside legal advice. County counsel vehemently denied this fact and referenced a legal brief she prepared, provided to everyone on pink paper which is customary practice. She stated she spent time and conducted considerable research to prepare the legal brief and stood by her position that the DA’s practice of paid time off for “on call” hours (that were apparently never logged or recorded) is illegal. Mr. Dow stated that the issue will be discussed in salary negotiations with the County. When was the “pink brief” sent to everyone. No one seems to know about it. She could have prepared it but did she distribute to all involved parties? Sounds like Mr. Dow, the Republican, is getting a taste of the Gibson/Hill dog and pony show. Only this time Brucie probably told Adam to keep quiet and he would do the talking so Adam would not ruin his good name!!!! You are wrong. It was “claimed”, not revealed, proven, or anything else. You are obviously an apologist for Covello and still bitter. Please read the San Luis Obispo County Pension Plan. Any employee promoted on his/her last day would not receive more money for retirement. The retirement amount is based upon the highest salary RECEIVED during a significant period of time. http://www.slocounty.ca.gov/Assets/PT/pdf/RFP/Part+F-6+The+Retirement+Plan.pdf. Who made the false claim that a person promoted on their last day by Dow would get more money for retirement? By the last day of employment, the retirement conditions would already have been determined and agreed to. Sounds like an honorary gesture. Will the circus ever end? Or do we just keep paying for the entertainment from the 3 ring circus? Next act please. This county is being run by a bunch of self serving lunatics who don’t give a damn about the citizens. San Luis Obispo: Come for the weather – stay for the money (and petty political drama). San Luis Obispo: A place to go to school, and immediately leave for the bay. When the average age here is 80, which must be happening quickly, you’ll see even more drama. hour was a waste of time if not for Gibson/Hill attempt to smear Dan Dow….the public is on his side as far as I’m concerned. Hill should go at the next election, then Gibson should retire to Cambria where he belongs. And the faxpayers should just shutup and not worry about having more and more money stolen from them, by this time Mr. Dow. She probably could barely think so stunned she did not have to put up her fists for the job. There is no way in her nervousness she could control the two bad boys. shocker……our district attorney thinks he is above the law…..
Look at the facts. It is the opposite. he put a stop to the practice, the first one in a generation to do so. I have no doubt, Dow will be vindicated. he is the most ethical person to run the DA’s office in this county’s history. Quit flapping your gums about something you know nothing about. Dow wants to go to court? That would be a first from the plea bargain king. Just proves how self serving political “leaders” are only interested in using tax dollars to help themselves. More evidence that SLO County needs a new District Attorney. Dow is letting the inmates run the asylum by giving them illegal comp time. He was told to stop this by his superiors, then went around their backs and hired a law firm (which no doubt he has personal connections to) that stated the practice was legal. Then Dow wanted the County to foot the bill for going against exactly what they asked him to do. Is it any wonder that all except Arnold (who is even worse than Adam Hill in viewing everything through a partisan lens) are pissed at Dow right now? He is doing a great job for the taxpayers! Do you have proof of this rather than a stupid slogan? EVERY DA BEFORE Dow was giving the benefit. When Dow was informed of the error, he STOPPED IT! The idiot CC was stonewalling him and was supporting the BOS…therefore Dow had no choice but to seek outside counsel. Speaking of fleecing the taxpayers, the CC uses outside firms for ALL their trial work. What about that? This article fails to mention that the firm consulted by Dan Dow, is also owned by a law school buddy of Dan Dow. I had a feeling Dow had some connection to the law firm he hired. Remember that back in 2014, Tim Covello, Dow’s opponent, said there was a problem in the DA’s office because attorneys weren’t willing to work a full 40 hour work week. Dow said it was a morale issue. Now we have Dow going to bat for his attorneys so they don’t have to work! Entitlement is of epidemic proportions in this country…..the lawyers and libturds have ruined the dam place.